It’s Time For The Good Stuff, aka Lisa Casalino! Lisa Casalino is living proof that dreams do come true. Of course, it takes talent, hard work, and determination. Since she’s not lacking in any of those areas, she’s now reaping her well-deserved rewards. Casalino’s real last name is Hertzner. But, she adopted her mother’s maiden name, because she says it “sounds prettier.” I think most of us can agree with that! Credit also goes to her mother for getting her started in music, as we shall see. Her dad’s amazing music collection also contributed to her love of music. Lisa Casalino is a New York native who moved to Florida in 1995, having earned a music education degree from the Crane School of Music in upstate New York. She took a teaching job at a brand new high school in Florida, in which she developed a music program. Years later she took up real estate. Of course, through all this she was also performing as a singer. Eventually, she decided to give singing full-time a shot. She thanks Tampa for giving her opportunities when all she had was a business card and a smile. The last couple of years have seen the talented singer realizing her dream. She released a Christmas single, but most importantly, she released a full-length album. 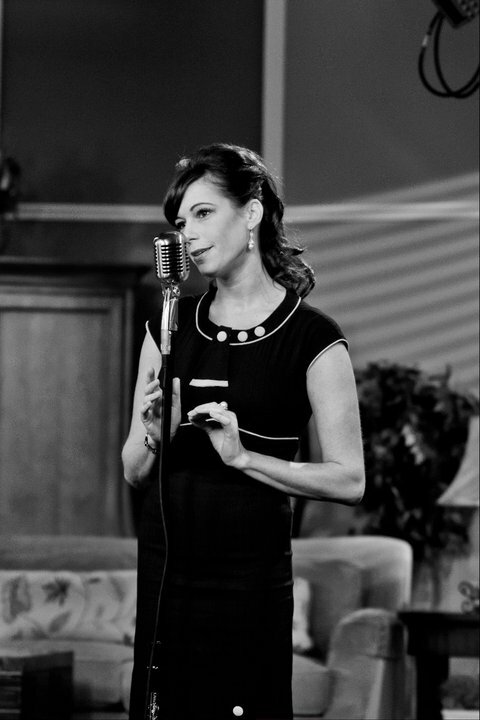 Introducing Lisa Casalino includes nine jazz standards and three original songs, also in the jazz vein. I met up with the charming Ms. Casalino at Love’s Artifacts Bar & Grill in Tampa, where she performs every Friday. We chatted in between a set of mostly Motown classics, and a set which leaned more heavily towards the material on her album. Whether doing Jazz, Motown, Country, or even No Doubt songs, you can be certain that with Lisa Casalino, you’re getting the good stuff! I read that your dad was a big fan of doo-wop music, and your mother taught you how to play guitar. Can you elaborate further on your musical upbringing? My parents were big music fans, and my dad had this huge collection of 45 records. We had a jukebox growing up. My mom played the guitar, and she used to play and sing to us. She taught me a few things, but I was mostly self-taught. I did take a few months of lessons. I have a bachelor’s degree in music education from the Crane School of Music in upstate New York. I underwent classical vocal training as part of the program. Which singers did you study the most? Why did you decide to move to Florida in 1995? There was a brand new high school [Durant High School, in Plant City], and there were no new schools in New York. It was all sort of “established.” So, that was a factor, and the warmer weather. You made a studio recording years ago, and you have said you weren’t satisfied with the results. What kind of music was it, and why exactly weren’t you satisfied with it? I was doing original songs. It was supposed to be contemporary, it wasn’t really jazz. It was pop, I’d say. Some of it was kind of country, actually. I kind of had an idea of what I wanted it to sound like, but otherwise I had no idea of what was going on. So this producer I was working with did a lot of it without my input. But, since I had paid him a lot of money up front, I let him finish it. But I wasn’t really proud of the way it came out, I didn’t want to share that with the world. I may revisit those songs eventually, though. Do you do vocal warm-ups before a performance? I used to, but I’ve gotten a bit into bad habits. When I’m not singing, I like to rest my voice as much as possible. Instead of doing warm-ups before the show, I start with songs that don’t push my range to its limits, so they sort of serve as warm-ups. How did you go about selecting the songs for your album? I collaborated with [guitarist] Nate Najar, and he co-wrote three of the songs with me. We picked out a bunch of songs that he liked, and that I liked. We just kept going through those, trying to figure out a good mix of songs. We didn’t want to do anything that was too overdone. The type of signature songs that people recognize an artist for. Songs such as “At Last” by Etta James, or “Somewhere Over The Rainbow” which brings to mind Judy Garland, etc. We wanted to steer clear of those. The album harkens back to the classic jazz vocal albums of the 50’s, but with a certain energy that’s all your own. Was it all recorded live in the studio like in the old days, or were the instruments and vocals recorded separately? It was all live. The only song I added vocals separately to was “Between The Devil and The Deep Blue Sea,” because I showed up an hour late, and the band had already recorded it. Everything else was recorded with all of us playing together, and with hardly any ‘punches’ [the practice of going back and fixing just one spot of a performance after the fact.] The track “I Get Along Without You Very Well” was one take. We never even rehearsed. We just had guidelines for the original tunes. Nate just told everyone basically what we were going for, and we just did it. It was amazing. Are there any plans to release another album in the future? And if so, is it going to be in the same vein as the first, or should we expect some detours? Yes, but I don’t know when. I’m still trying to sell this one! I’ve sold over a thousand copies, and it’s been played on the radio, all over the world, which is great. I’m going to do more originals on the next one. I need to get with Nate on that, because we write together. I wrote a Christmas song on my own, though. So, I’ll probably do more of those jazz tunes. However, I’ve been writing some stuff for specific reasons, and it’s not jazz at all. They’re more country, actually. I know you don’t like country, but you might like my songs! I don’t know that I’m going to do actual albums, though. I did the Christmas song as a single, and singles work good, too. You mentioned adding more originals to your next recordings. Do you foresee adding a significant number of originals to your repertoire? Yes. On the first album, there’s three originals and nine standards. On the next one, I’d like it to be closer to half and half. And then eventually move my way into a completely original album. Which is very brave, especially in Jazz. It is, but I’ve had a lot of positive feedback from the original tunes, and they’re basically my favorites. Do you think the general public is really open to fully embracing new, original compositions? Well, not the mainstream public. If you’re not a jazz person, you can appreciate it for what it is, but you might not get much into it. My mom is not that big into Jazz, for example. She likes the other stuff that I do more. Don’t get me wrong, she’s proud of me and supports me, but it’s just not her style of music. But, I think for me, it’s about where my voice fits best. You gotta play to your strengths, and I do like Jazz. Some of what I sing is Jazz, and some of what I sing is from The Great American Songbook – standards. But, people basically lump them together, because it’s old school. Is there anything on your music collection that would completely surprise your fans? I love A Tribe Called Quest. [laughs] I listen to all kinds of music. Like I said, I grew up in the 80’s-90’s, so when I was in college I was really into hip-hop and rap. Back in middle school, I was into Mötley Crüe, Bon Jovi…all those guys. I love Pink. I’m even going to go see her in concert. I like the Beastie Boys…I don’t stick to just one type of music. Now, I like to listen to Broadway music, or acoustic music as well. It’s funny, because you wonder at the beginning of the year, “Where am I going? What’s important?” I feel like I may be the 12 or 15 year “overnight success.” Things are starting to happen, I’m starting to branch out more. I want to do bigger shows, concert-type settings. My long-term goal would be to reach the level of a Michael Bublé, or Diana Krall. I don’t know exactly how I’m going to get from here to there. I’m just going to keep singing, and doing what I do. I’m not really a person who has an agenda, I just do what comes naturally. So far, it’s been working for me. It’s not always about the destination, but about the journey. Three years ago I was teaching, selling real estate, and singing. I was doing three full-time jobs. And for over two years now, music is all I’ve been doing. It’s going well enough that I’ve been able to help out other musicians, getting them work. Thank you! I think this was really sweet. I appreciate you taking the interest. This entry was posted on January 12, 2013 at 5:04 pm and is filed under Interviews, Singers with tags jazz singer, lisa casalino, lisa casalino interview. You can follow any responses to this entry through the RSS 2.0 feed. You can leave a response, or trackback from your own site. Feels like Roxy Hart (Chicago) meets Norah Jones. I like it. So great to see you here! You are even more cool on this page than you are the other! Thank you. Music is the one subject I know the most about.